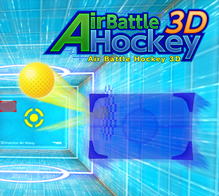 Air Battle Hockey 3D was delisted from the Nintendo 3DS eShop in North America in May of 2018. According to a Wikipedia discussion started by user Kristie Ann Webb this is when several 3DS titles published by Agetec were removed from the eShop. Many of these titles remain available in Europe as of this writing where they were also published by Agetec. “The basic rules are familiar: use a racket to hit a ball into the opponent’s goal. The first one to score ten points wins. The game features special Skills and Targets. There are six different offensive and defensive skills. Play aggressive and attack with the Lightning Shot skill which changes direction of the ball during mid-flight, tricking your opponent in scoring a goal. Play defensive and use the Hyper Racket skill to increase the size of your racket improving protection of your goal. Watch for Targets that appear during the game, hitting those triggers various events, such as an increase ball speed or reducing your opponent’s skill gauge to zero.